Sorry, die-hard Justin Bieber fans, but this is a bad as Photoshopping can get. Or does he really enjoy putting on that heavy black eyeliner and lip gloss? 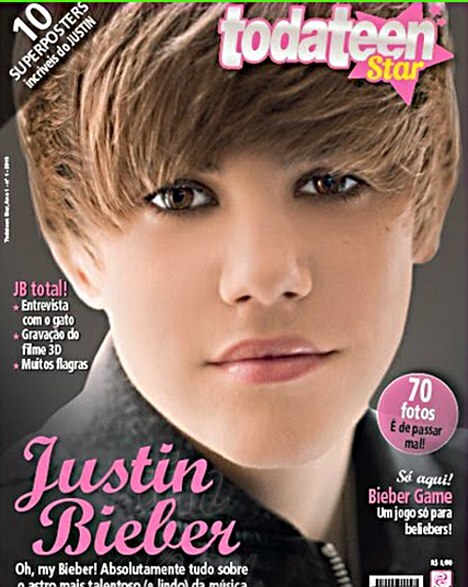 Justin Bieber is on the cover of the new issue of the Toda Teen Star, a Latino magazine for teenagers. I don't think that the girls will be happy to know that Justin Bieber would very much like to put makeup on himself as much they girls do. I don't want to think that he is gay and I am sure that if he is, he would never admit it unless he wants to lose the millions of fans he has from all over the world. The fans are making him earn the millions of dollars he is earning now. What should we look forward to from Justin Bieber? He is launching his nail polish collection soon called One Less Lonely Glitter, inspired by his songs and designed by him. What kind of guy designs freaking nail polishes unless he is gay? Oh and he is also launching his new fragrance soon called My World, with a little help and advice from his fellow celebrity and close friend Kim Kardashian. I don’t have any other information about this yet, except that Justin Bieber confirmed that scent would be far from fruity and that the perfume would come in baller bracelets and dog collars. Thats so not him true i mean he does wear make up but only on the lips and he has to drr!! And why do you make fun of him why are you just jealous?! Calling justin biber gay is an insult to the gay community. Thats rude! Andrea it's true i did it for todateen. It was so fun if they asked me to work with them again I would do it in a heart beat. Follow me on Twitter. Now i have a facebook. "What kind of guy designs freaking nail polishes unless he is gay? " Is a stereotype and you can shove it. I am gay and I don't wear makeup and I don't design nail polish. he's not gay...she's a lesbian!!! I'd ask instead wtf is going on nowadays with guys looking more and more like girls...??? seriously, enough guys with all this makeup crap, shaving body parts, etc... act like men for f's sakes! come on people being jealous is a sickness justin bieber is so cute and you know it . i wish him only great things. love you justin. justin bieber don't worry about what other people think about you. i think that you are fine the way you are. lol. but seriously though. lol. i know you are not what some of these people are saying you are and if i were you i would just blow them off and just be like whatever. lol. but seriously though. lol. like i said though i think that you are fine the way you are. lol. but seriously though. lol. his not gay his the most taleneted guy ive eva met..